Theodora Varnay Jones, "Reflections," 2018, photomontage (unique) on Hahnehühle, 9 1/2 x 16 1/2"
Varnay Jones considers photography and frottage (rubbings) to be similar, since they are both directly related to the objects that they depict: they’re emanations, in a way. In several pieces in the show — “ F-11 (Homage to M.G. ),“ “F-9” and “F-10” — the titles designate frottage. These were inspired by the artist’s residences during the past two years, in rural, quiet and technology-averse studios north of San Francisco: at the Lucid Art Foundation, in the Marin County town of Inverness, in fact in the former studio of the late Surrealist/abstractionist Gordon Onslow Ford; and at the Morris Graves Foundation, in Humboldt County. Frottage in these magical time-warp locations became a non-photographic way to ‘record’ intriguing objects — Graves’s kitchen table, in this case — and to create an alternate object for further exploration. The rubbings, made on opaque and translucent papers, superimpose, but not precisely, a sense of movement and change, of depth and time. Other works take the same quiet route to mystery. An untitled, unframed wall piece of crumpled paper, irregularly circular and pleated, and coated with dark, glossy graphite, suggests a silent mineral world (as well as Max Ernst’s Surrealist 1925 frottage, “The Earth As Seen From the Earth”). 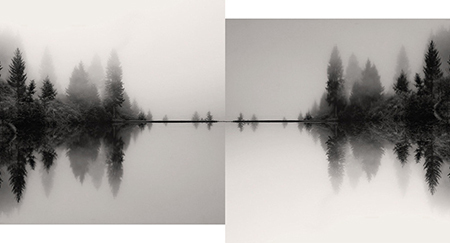 A series of silverpoint botanical drawings and layered and flipped river-landscape photographs pay homage to Humboldt County’s natural glories, but transmute them into ambiguous symbols, floating worlds and vehicles for reverie. A pair of assisted-readymade sculptures (painted and repaired with gilding, kintsugi-style, or juxtaposed with other elements), transform a piece of fissured wood and a jumble of the protective paper removed from Plexiglas, “Mimic” and “Variant,” respectively, and show again that creative value can be coaxed from the most mundane materials.